You run the application, try out a few scenarios and see that it seems to make sense: you always wind up in bed when it’s late and generally wind up in bed when you’re tired, so you deliver it. You figure this makes sense since you’re usually tired when it’s late. Satisfied, you deliver the code and reason that it’s almost certainly fine and, if not, the architect will let you know in the next few days when she reviews the code. She’s put your code back to the way it was. Your sense of unease growing a bit, you walk over to her desk and ask why she reverted code that you added as per a new requirement. She testily tells you that she doesn’t have time for “Programming 101” right now and says she’ll go over some basic stuff with you next week. What happened, and what should you do? Given that the architect’s displeasure revolves around the inclusion (and later omission) of an if condition, it’s a safe bet that we’re going to be covering Boolean logic in today’s post. Most people think of conditional control flow operators that you see in programs such as if, else, and switch/case in anecdotal and somewhat intuitive terms. Statements like “if my favorite sports team loses today, I will be sad” are the cornerstone of deductive reasoning, a mental exercise that is nearly universal to human communication and certainly not limited to programmers. And if you come to programming from a largely self-taught background with limited exposure to mathematics, this is probably the extent of your experience with conditional operations. You’re likely to reason about conditional operations the same way you reason about conversational ones. This conversational reasoning works pretty well on simple code scenarios in code with situations like “if x then y else z” but it starts to get a little more interesting when there are compound conditions strung together with AND and OR. When this comes up, programmers and people in general without a mathematical background are likely to start struggling with keeping it straight. For example, consider this sentence: “If my dog is sleeping and my car is unlocked or if my car is locked but the keys are on the coffee table and I’m near the coffee table or else if someone can give me a ride, I’m going to go to the store.” Ready to start coding that up? Will you feel good about getting that right with an intuitive approach? (Truth) Value: True (T) or False (F) in the Boolean world. (Basic) Operation: Algorithm applied to one or more values/variables to yield an output value/variable (e.g. “And”, “Or”, “Not”). Expression: Any grouping of operations, values and variable with a resultant truth value (e.g. “A”, “True”, “A AND True”, “A OR NOT(B)”). 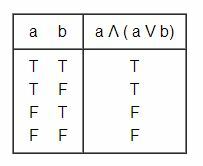 Truth Table: An enumeration of all possible expression inputs and their resultant truth output. Notice that in this description of the basic operations, I do not use their common programming language equivalents such as “&&” and “||” (bang (!) operator being an exception). This is intentional. For one thing, these operators in their programming language contexts often have meaning beyond Boolean algebra (such as bitwise operations, which I will cover in a future post) which would distract from this post and for another thing, it is important to keep in mind that we’re operating outside of a programming contexts. Here, our expressions are propositions rather than representative of some kind of state of a program. Looking at this table, do you notice anything interesting? The expression is true in the first two cases and false in the second two. Just like the “A” variable. In fact, it’s identical to the A variable. The B variable doesn’t matter at all! Truth tables are not rocket science. In fact, they’re one of the easiest mathematical concepts you’re likely to encounter since they are simply brute force documentation of an expression. But they will help you see patterns. You’ll see patterns directly in the manner we laid out here, but as you get familiar with truth table patterns, you’ll start to apply them within larger conditionals as well and even to recognize intuitively and automatically situations that can be simplified. Or, if you don’t recognize them immediately, you might at least suspect simplifications are possible and write out a truth table to confirm or refute your hypothesis. 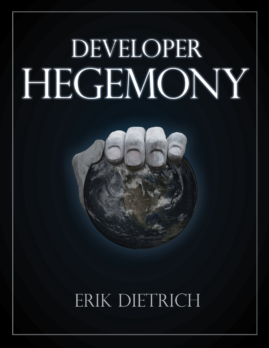 This has a powerful impact on your code. Instead of large and laborious conditionals strung together, you will gravitate toward the simplest possible representations. Not only does this keep the code clean and readable, but it also helps with your clarity of thought from a requirements and reasoning perspective. Consider our example situation. Isn’t it nice to be able to say to the PM, “hey, we should talk about what you want here because the requirement you added actually has no effect as you’ve stated it.” Without a knowledge of Boolean basics, you’d have a hard time recognizing this yourself, much less explaining it to someone else. And finally, this understanding gains you respect from your fellow programmers. If you write big, unwieldy conditional statements, often containing redundancies or tautologies (statements that always evaluate to true, such as “A OR NOT(A)”), other people will come to view you as sloppy or poorly informed as far as programming goes. The example with the architect isn’t far-fetched at all. It pays to have a basic understanding of Boolean logic and some of its rules for the sake of being taken seriously. You don’t need to be an expert in the various transforms and axioms in Boolean algebra (which I will cover next time) to get this right. A truth table may seem cumbersome and it may feel sort of plodding and non-elegant, but it’s a surefire way to get things right, look for patterns, and feel more comfortable in the conditionals you’re writing. Practice them and know them and you won’t be sorry. There are some other operators (NAND, XOR, XNOR, NOR) that can be composed from AND, OR, and NOT, which you can read about here. NAND (and NOR) has the interesting property of being functionally complete in terms of logic (meaning all other operators can be derived from it). You can read about that here, though it’s framed in terms of circuits rather than pure math. This is a cool site that will generate actual truth tables for you if you punch in an expression. Here is a very rigorous, but math jargon-heavy reading about Boolean algebra, how it is constructed from axioms, and how it relates to other mathematical systems. Warning — this is not a light read. 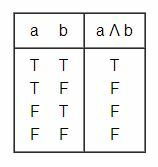 On the flip side of jargon-heavy is this practical, conversational series of examples of truth tables and the reasoning behind them.